Editorial Welcome to the April edition of the Newsletter. Recent weeks have been slightly quieter following the high point of our year—the AGM and Conference , held at Malvern at the beginning of March. Feedback has been good and the committee will build on the success for next year, and beyond. Continuing our policy of seeking articles from Professional Landscape Photographers, we have two this month. Rachael Talibart gives us her thoughts and procedures involved in her seascape work, whilst Rod Ireland completes his two part article on ‘Design in mind’. Some notable landscape photographers will contribute later this year, and will include David Clapp, Lizzie Shepherd, Andy Farrer and Mark Bauer. Please let me know your thoughts about these articles. Do you find them interesting and helpful, and do they add to your photography ? Do you have a specific subject in mind? We also have more field trip reports from Torridon , and New Brighton. I was fortunate to lead a long exposure field trip to New Brighton in March. Following some stormy weather, we were pleasantly thrust into a bright sunny day, but with no clouds—which took away one staple ingredient for slowing down movement. It’s never perfect is it! However, I think everyone got maximum benefit from the day, and I’m grateful to Margaret Beardsmore for her write up of the day, and the other contributors for their images. Field trips are very popular—with visiting members appreciating the experience of someone familiar with an area, who can pass on local knowledge—thereby saving the need for a prior recce, sometimes at considerable distance. So, why not try and arrange one yourself? If you have the knowledge but you are unsure about what is involved, contact Dave Glenn, our new Member led events organiser, who will advise you and help you to prepare. davewglenn@googlemail.com Brian Fleming gives us an interesting article on wreck hunting—a popular subject for seascape photographers . There’s plenty to read and choose from , whether it is field trips, or workshops. Keep sending me your reports and images. All contributions are appreciated. Tides and Tempests: Coastal photography By Rachael Talibart The ocean is one of the most exciting subjects a photographer can choose and we are lucky in the UK that the coast is within a day trip of almost everywhere. About three years ago, I made the decision to work exclusively at the coast. This may seem strange for a photographer based in North Surrey but the sea has always been a large part of my life. I grew up on the coast and it still feels to me like a homecoming every time I go there. I think it’s fairly obvious that we’re more likely to make powerful photographs if we work in a place where we feel inspired. For me, that place is the coast. My closest shoreline is in Sussex and I visit it every week. I believe there’s value in repeatedly working at the same place. Although there’s always an element of chance with the coast, repeated visits will help you to understand your chosen location. In particular, knowing how the tides affect your location is essential. Yearly tide tables are useful but they’re published in advance and all sorts of conditions can affect tides. I like the website www.tides4fishing.com and they now have an app: Nautide. This not only gives the times of high and low water but also the coefficient, the difference between the depth of low water and the height of high water. When the coefficient is large, low tide will reveal things that usually remain hidden and high tide will lap around objects that usually remain dry. Finally, I believe that working in places I know well makes me more creative. I’m far more willing to risk wasting time on experiments than if I think I may never return. The sea is in constant motion so your choice of shutter speed will have a profound effect on your photograph. Very fast speeds will freeze every droplet, creating a sculptural effect. For most of my Sirens series, I used a shutter speed of 1/1000 to reveal the strange shapes made by storm waves that we would never normally notice because they’re moving. Alternatively, long exposures, often requiring filters, will smooth out texture to create a more ethereal mood. If the sea is foaming, long exposures may make the water seem to turn into mist. If you can find an interesting object and use a steady tripod so that the object remains sharp, the contrast between the water and the solid can be very powerful. Days on the shore are exhilarating but you must protect yourself and your gear. My camera and lenses are weather sealed but, if it’s really wet out, I also use a plastic rainsleeve. A lens hood is essential to keep spray off the lens. If you use a tripod, make sure you wash it in fresh water as soon as possible after you’ve left the beach. Salt corrodes, fast. Most important of all, consider your own safety. Knowing your location helps with this. Also, teaming up with another photographer is a good idea but, in rough seas, he/she is probably not going to be able to save you and might even risk his/her own life trying to help. The best advice is to make sure you don’t get too close. Use a longer lens or simply reject the composition if you can’t do it safely. I do not put myself at risk for my storm photographs. A 70-200mm lens, a low point of view and plenty of practice enable me to make it look as though I am in the sea when I am, in fact, perfectly safe. ‘Song of the Sea. look like you’re in the sea when you are, in fact, perfectly safe. ‘ An ability to react and adapt are useful qualities in the coastal photographer, but there’s still plenty of scope for planning and developing concepts. Sirens is an example of this and it put into practice a lot of the things discussed in this article. During winter 2015-16, I visited Newhaven, in East Sussex, repeatedly. I knew Newhaven beach gets good waves and I wanted to capture that in action. I wasn’t especially lucky – when there were waves, there was no light, and when the light was good, the sea was calm. RPS Landscape Photography workshop with Mark Banks Torridon 30th March – 4th April 2019. The plan was to meet at our venue for the week, The Old Inn at Gairloch, on the evening of Saturday 30th March. I was more than happy to be revisiting the Inn which whilst being a little dated, is warm and friendly with great staff and provides an excellent range of well-cooked food and packed lunches as required. It also caters well for those requiring Glutenfree or other restricted dietary options. Gairloch itself is a small fishing village located about a 90-minute drive West and North of Inverness. It is surrounded by the Torridonian mountains to the North, East and South East, provides access to some stunning coastline and is central to the locations that Mark planned to visit based on his extensive knowledge of the area. Saturday evening came and the participants met for the first time over drinks followed by an excellent evening meal. The atmosphere was very relaxed and convivial as Mark made the introductions and outlined his plans for the week. Mark is very conscious of health and safety during workshops and took time to ensure that everyone was aware of the potential issues. The group size was larger than I was expecting for a single leader (there were 8 attendees), but Mark Banks explained that Mark Reeves (Landscape Group events manager) would be assisting with transport and other organisational aspects of the trip. With the introductions complete, Mark explained that he would be setting us a challenge for the week ahead in the form of a project that required us to produce two images in each of five categories (Big vistas, Cameos, Movement, Weather and Woodland). At the end of the workshop the images would be shared during a friendly review session. This was the first time I had been set such a challenge on a workshop and whilst I was somewhat nervous about it, I quickly concluded that it might help me to make the most of the various locations that we would be visiting. It is inevitable that on any landscape workshop at this time of year, the choice of location for shooting on a particular day is very much dictated by the weather and the light. Mark was very meticulous in checking the forecast and selecting locations which would allow us to make the most of the conditions. A further constraint in remote, sparsely populated areas such as Wester Ross, is that the travelling times between locations can be lengthy and Mark was careful to ensure that we weren’t wasting too much time on the road. Waiting for the Tide by Dr Brian K Flemming, LRPS Photoshoot 8th and 16th May 2017 I'm waiting at the exit of the car park leading onto the beach. One eye is on the car, making sure it stays safe: there's a suspicious-looking character wandering around the area and one can't be too certain. It's late in the day and all the day-trippers have gone home: there's only me with reason to be here. Eventually, the would-be dodgy itinerant disappears up the John Muir Way and doesn't return. I can relax and concentrate on my intended vigil. The other eye has been on the beach, watching the tide recede. It is a clear evening in the middle of May, and the sky is still bright. Sunset at this time of year will not occur for another hour or so. It is also an hour or so to low tide: I've arrived early in order to see the timbers of an old boat emerge from the waves as the tide ebbs away from the beach at Seton Sands by Longniddry. The aim is to complete the photo-shoot I'd started a week earlier and be in a position to photograph the wreck at sunset as the tide receded. I was in luck. The period of fine weather we'd been experiencing during the first part of May was holding: high pressure had been in charge for over two weeks now and there was hardly a cloud in the sky. I was looking forward to a real bean-feast of a session. All the ingredients for long-exposure photography of the surf washing around the barnacle encrusted wreckage were falling into place. Little appears to be known about the boat: it is presumably the wreck of an old fishing vessel, but there is nothing to be found online to suggest that that might be the case. It is clear however, that the wreck has deteriorated considerably over the past decade. Photographs from the late "noughties" show a considerable array of ribs and planking marking out what seems to have been a sizeable vessel; but no longer: all that remains now of the boat are the stem post, the keel planks and half-a-dozen or so ribs on either side of the bow section. The skeletal outlines of the old boat become more visible with each passing minute. Soon I'm able to get in amongst the timbers themselves, splashing through the surf and gradually lengthening the exposure as the light faded towards sunset. The light was incredible: the horizon continued to glow orange while the sky above started to turn a deep blue, and the sea reflected the sky. I stayed for as long as I could, until the exposure duration reached 30 seconds: the maximum it could go before having to switch to B mode. Yes, I could have upped the ISO setting, but I'm a fiend for keeping it as low as possible. In any case, I'd been working for a good hour; time to go home. Long Exposures on the Wirral Peninsula - 23rd March 2019 Margaret Beardsmore LRPS Our day began at New Brighton where we met at the Perch Rock Car Park to take images of the Lighthouse.This was really useful as it gave us time to have a bit of a wander around the beach till we found compositions that suited us before the beach became too busy. Unfortunately it was a beautiful sunny day, which made long exposures a bit difficult - but also meant that lots of people decided to have a day out at the seaside. I had gone up to the Wirral the previous night with my husband who had taken the car to go birdwatching so I was grateful for a lift from Mick our group leader. This meant that I didn’t have the stress of finding parking spaces and locations. There was a particularly high tide over the weekend, which when coupled with a very slow moving vehicle in front of us, pretty well scuppered most of the photo opportunities at our second location, so we moved on to the Causeway at West Kirkby to take minimalistic images. (The RNLI were moving a broken down lifeboat trailer, which delayed us by 20 minutes. Ed) On our arrival, the Causeway was partly under water, and the tide still coming in. Mick explained just where to walk so that we didn’t get into trouble but after a bit of discussion we chickened out and decided to wait until the tide was receding which gave an opportunity to each our lunches. When the tide began to go out Mick explained how we needed separation between the various bits of railings to make a good image, and also when it was safe to walk through the water. We needed to work quickly as the tide went out very fast. As the tide receded, we also had to contend with tourists starting to walk up the causeway alongside us. There was also the small matter of sailing boats going to and fro in front of the cameras - thankfully the long exposures made most of them vanish as if by magic! We then returned to New Brighton for more Lighthouse images before the tide went out too far. I found it to be a really interesting day, and was grateful to Mick both for the lift and also helping me when I had a tripod problem. One of my main learning points was just how quickly you need to work when doing coastal shots. It was invaluable to have Mick’s expert knowledge of the location and tides. Personally I enjoy going out with a group and feel a lot safer than if I’m on my own - especially if wading into water! "Design in Mind" - Elements of Design in Landscape Photography, Part II By Rod Ireland This is the second instalment of a two part article examining the key design elements available to landscape photographers. It's argued that creating good landscape images requires that we recognise the different design elements available within a scene, utilising these to create the best possible image. Part one examined Line, Shape and Form. We'll now consider three further design elements: Colour, Pattern and Texture. Colour Colour can play an important role in the design of an image. As with other design elements, colours can elicit different moods and interpretations from the viewer. It's beyond the scope of this article to cover colour theory, but if you're not familiar with it, take some time out to learn about the 'colour wheel' and how colours 'work'. There are three popular 'colour schemes' for photographers to consider: Complimentary colours - These sit opposite one another on the colour wheel and put simply, they look good together being balanced and not competing against one another. Analogous Colours - Are those sitting alongside one other on the wheel. There will be one main colour that they share in common (usually a primary colour). Examples are orange-red and yellow-green. This scheme is common in Landscapes, such as within an autumn wood. Monochrome - Landscape photographers might commonly think of monochrome as simply being black and white. However, it can actually refer to a scene where there is only one colour value. A common example in landscape is during a sunrise or sunset where there is a haze in the air and just varying shades of orange. The green and red in the image above are complimentary to one another, whilst the yellow is analogous to the green. Colours can be split broadly into two groups - 'warm' and 'cool'. Warm colours are reds, yellows & oranges and these can elicit a range of feelings from happiness all the way through to anger! Blues, violets and greens are the cool colours and when these are prominent in an image they can create a peaceful and comforting mood. The first step to using colour as a design element is to be aware of it in the landscape. Think about the colour scheme available in front of you and try to use it to reinforce a sense of mood, or meaning within your images. This picture is all about the subtle transition of colours from blue to purple. These colours help give a sense of calm to the scene. Pattern In part one of the article, we talked about lines, shapes and forms and when these design elements repeat, they can create patterns. Landscape scenes will often contain patterns which can be utilised to create stronger images. Patterns can create a sense of harmony and rhythm. Filling the frame with the pattern will help emphasise this within your images, particularly where there are a regimented series of repeating objects. The repeating pattern of these mammatus clouds provided a striking subject. To shake things up a little, or to perhaps introduce a sense of unease a common theme is to interrupt or break the pattern with an element within the image. It can be an object that is in clear contrast with the rest of the objects; be it in shape, colour, or even texture. You can place your "odd" object along one of the thirds or intersecting points. Playing with your depth of field means you could have the contrasting item in sharp focus and the items around it fading slowly into the out -of-focus. Broken patterns can be found naturally, or some situations can be manipulated to disrupt readily existing patterns. Using a shallow depth of field has provided a point of contrast within the pattern of daises. Look out for patterns in order to change what might be an uninteresting scene into something with greater impact on the viewer. Altering your viewpoint in the landscape is often key, e.g. a pattern of walls in a field system might not be visible at ground level, but a short stroll up a hill can reveal a striking pattern. By shifting position, I was able to move the contrasting tree into frame, to disrupt the regimented pattern of trees behind it. Texture Texture can bring an otherwise bland scene to life. Where there is an obvious texture present, this can be used in a powerful way to make a two dimensional scene look three dimensional, a consideration that is often in the forefront of the landscape photographers mind. Talking about texture in images can be a difficult thing to explain but a good place to start is to think about what the surface of the subject would be like to touch. Would it feel rough, smooth, sharp, soft? Then move on to think about any variance the surface might have. Does it change in respect of its shape, tone or colour range? The grass in the scene above looks like it would feel very soft to the touch, therefore the element of texture is present and emphasised by using a long exposure. In order to see and capture texture a key consideration is light. Just as with form which we discussed in part one of the article, a sense of texture can either be accentuated or diminished depending on the way in which light is present in the scene. The greater the contrast in light hitting our surface, the more obvious texture becomes in the scene. Side lighting during an autumn evening has emphasised the texture within the field. During the middle of the day, look for vertical surfaces such as tree trunks or dry stone walls. With light coming from overhead the areas of highlight and shadow on the surface will be emphasised, in turn making its texture more prominent. With the sun low in the sky at either end of the day, turn your attention to horizontal surfaces. As well as the position of the light, the position of the photographer is important and varying the degree of angle between the subject and the camera will give you different results. There is a contrast in textures within the scene belowâ&#x20AC;&#x201D; the smoothness of the water and the rough surface of the boulder. 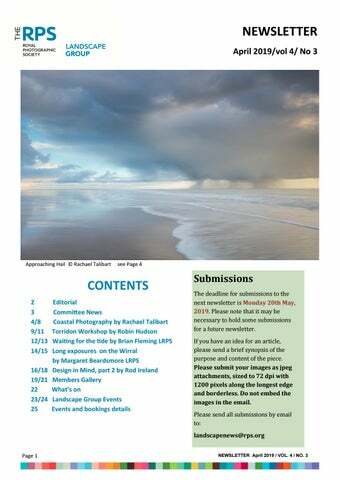 Submission Guidelines Please send your Members' Images by email to landscapenews@rps.org. Please submit your images as jpegs, sized to 72 dpi and with 1200 pixels along the longest edge. It would also be helpful if you would provide a caption and a note of any RPS distinction that should be added to your credit for the image. The deadline for the next newsletter is Monday, 20th May 2019. Thank you! Some images from Carmen Norman’s workshop, on Sunday, 14th April, at Blea Tarn in the Lake District. 5th February to 6th May 2019 Don McCullin is one of the greats. With more than 250 prints—all made by McCullin himself—this Tate Britain exhibition covers his entire career, from early work covering poverty in Britain to photojournalism of wars abroad and his latter interest :Landscapes. This woodland event, led by Nathan Barry, will be based in several areas of ancient woodland around the Northamptonshire area. In spring, we can expect to find plentiful bluebells, although their peak season is not possible to predict in advance! 7th July 2019 West Midlands Julian Rouse LRPS, an Adobe Lightroom expert who has delivered many successful courses for the RPS, will lead the workshop. There will be a maximum of 8 delegates, to ensure a good level of personal attention. Visit the beautiful South Downs in an area protected by the National Trust. Capture light as it sculpts the shape of light over these magnificent hills and find plenty of new compositions as you pass over each individual hill along the South Downs way. Join of of sheer indulgence andand learnlearn Join Mark Mark Banks Banksfor fora aday day sheer indulgence how how to to take take the the most most exquisite exquisite autumnal autumnal images. images. Could you host an event? 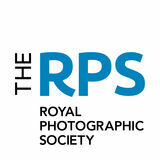 If you know of a promising and photogenic location in your area, and you would be willing to organise an informal session for other members of the Group, please email to rps.landscape.events@gmail.com. We welcome all volunteers and would very much like to hear from members in all parts of the UK. Event categories The categories below aim to help members understand what is on offer at any particular landscape group event. They are also a guide for potential event leaders who might be worried that their photographic skills are not sufficiently strong for them to lead an event. Group A â&#x20AC;&#x201C; Field trips where the guide has a good knowledge of the location (e.g. good viewpoints, good subjects, good times of day, tides if relevant etc.) and will have ideas about what to do in case of unhelpful weather or light conditions, but does not wish to offer any advice on photography skills or techniques. Group B - Field trips where the trip leader has a good knowledge of the location (as in Group A) but is also willing to offer general technical support and advice to inexperienced photographers. The leader is NOT expected to be an expert in anything but should be sufficiently experienced to pass on knowledge of the basics. Group C - Field trips that focus on a particular technique â&#x20AC;&#x201C; such as long exposures or photographing at night. The leaders of these events will primarily offer advice about technique and location knowledge will be sufficient to enable participants to learn and practice the technique(s) concerned. Group D - Workshops that primarily focus on skills or technique and where location is irrelevant or is a secondary consideration. These may take place indoors or outdoors. The workshop leader may have limited knowledge of the location but will be experienced and skilled in the topic of the workshop. Booking Confirmations A few members have contacted us because they were unsure as to whether or not they were booked on an event. Here is a brief guide to how you can check this for yourselves. When you book a landscape event through the RPS website, the system should send you a confirmation email. If you have not received it and want to check if you are booked on an event, then login to your account on the RPS website, select the tab labeled events and tick the box for events you are booked on. Any events you have booked will show up in orange.